At Wharf Gate (AWG) prices received for export logs increased $3-$4 per JASm3 in December. While there were slight increases in CRF log prices in China, and minor decreases in ocean freight costs, the AWG increases were primarily due to the continued weakening of the NZD relative to the USD. The log markets in China show a steady build in demand with a record 82K m3 daily offtake. Softwood log stocks at less than 3M m3 are about 35 days of supply. India has seen a slight improvement in demand, and stocks contain about two months of supply. Log stocks in China will increase during the Chinese Lunar New Year in February, but this increase will start from a low position and most exporters predict little change to log prices as a result. The log stocks have been as high as 4.5M m3 during the year and the market worked through this volume with little issue. 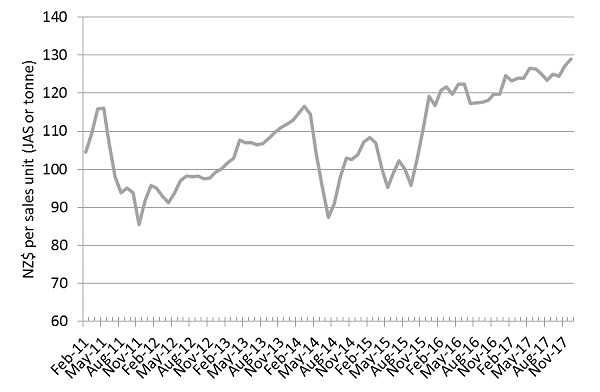 Due to the increase in prices for export logs the PF Olsen Log Price Index for December increased to a record $129. (See PF Olsen Log Price Index below). The average sale price is currently $13 per tonne above the three-year average. The domestic mills report very little change in domestic demand other than the usual variations due to weather and the end of the year. The consensus from mills is that this has been one of the most stable years in memory. Firms supplying trusses and frames report slow demand for December. They expect this is due to building companies concentrating on finishing projects before the end of the year, rather than starting new ones. The biggest issue for domestic mills in 2018 is likely to be the increasing price of logs. For a couple of reasons many mills are not able to recover this increased cost to their business. Increases in domestic lumber prices generally must be signalled three months in advance. On average a third of a saw log is converted to chip, and there has been very little movement in this price. Both supply into China and log usage has increased to record levels. 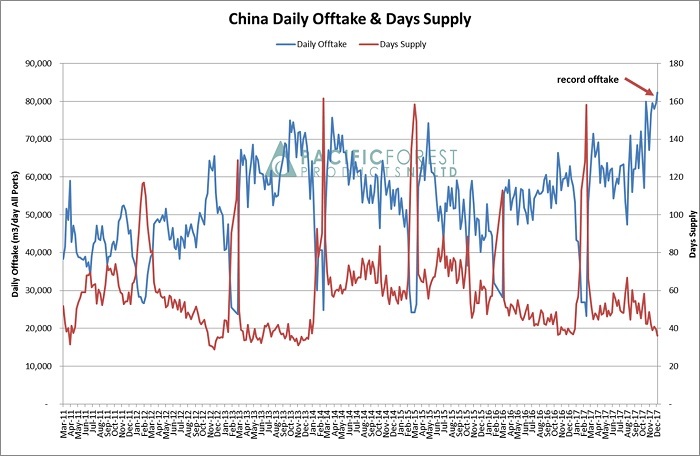 PFP estimated record daily offtake of 82k m³ over the last week in China. We also continue to see a geographical expansion of usage for radiata logs in China, as new ports and transport hubs continue to be built in China. As the chart below shows log supply to China has increased 21% for the 12 months ended October 2017, compared to the same previous period. 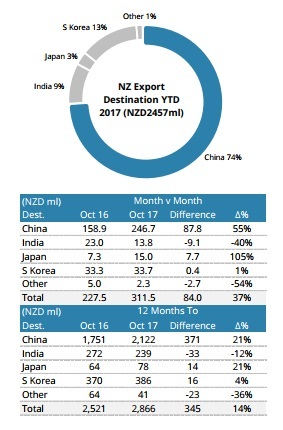 China is the destination for 74% of New Zealand’s export logs. 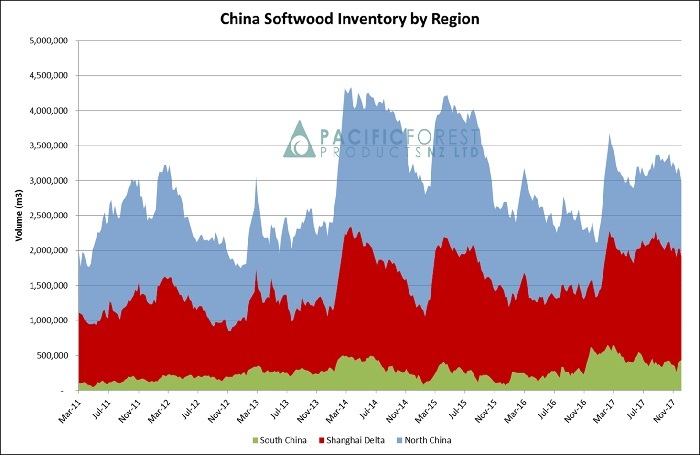 The softwood stock levels across China have dropped to below 3M m3 for the first time since May and this represents approximately 35 days of supply. Rayonier report logs stocks of about 200,000 m³, which constitutes two months of supply to the market. Some exporters to the Indian market report solid orders for the next few months, while others remain cautious in the short term. Weyerhaeuser, in conjunction with ZINDIA, commenced supply of Southern Yellow Pine from eastern USA to India in November. They report good sales, which is interesting as this species has traditionally been seen as inferior to radiata pine by Indian log buyers. There has been dramatic reduction in the supply of hardwoods to India. International banks now refuse to facilitate transactions for traders in illegal wood, which had been a significant portion of the log supply into India. The introduction of GST seems to make it harder for the agents or “middlemen” in the supply chain. We see more sales by exporters directly to end users. The ocean freight price to ship logs from New Zealand to China has decreased slightly. As per comments in last month’s Wood Matters most exporters expect ocean freight prices in 2018 to be higher than 2017. Port congestion in New Zealand is becoming an issue as ship delays add to ocean freight costs. The exchange rate continues to have a significant impact on AWG prices for logs. There has been a recent recovery of the NZD, but the US is expected to increase interest rates, and this will likely strengthen the USD. The PF Olsen Log Price Index for December increased two dollars from the November index figure and is now at a record $129. The index is currently $7 higher than the two-year average, $13 above the three-year average, and $18 higher than the five-year average.